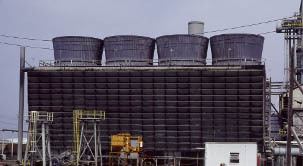 Upgrade Your Cooling Tower to improve its Energy Efficiency and Performance! 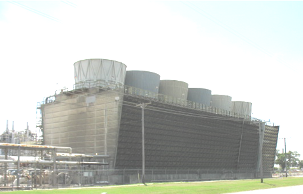 Phelps Engineering has specialized in the upgrade of cooling towers for over 45 years. We have designs for the upgrade of both crossflow and counterflow towers. Our upgrades normally get between a 3º and 5º F improvement in cooling water temperatures. Our upgrades are turnkey where we provide the materials and the labor, and guarantee our results. We provide labor that meets your safety requirements. Our upgrades are normally done during the cooler times of the year when one cell at a time can be taken out of service. 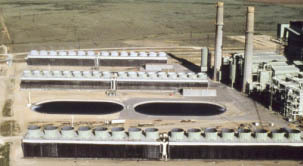 Some in the cooling tower industry claim to do upgrades, but they are usually changing one type of splash fill for another. If your existing fill is in good shape, then the improvement a splash fill replacement will be around 0.5º or a little more. If your existing fill is in bad shape, then the improvement will be more, but in that case, you are performing a repair and not an upgrade. You will be bringing the performance back to what it was originally, or perhaps slightly more with a newer splash fill. To get the 3º to 5º improvements we are getting requires one of our upgrades. If there are fill repairs to be made to the existing splash fill during the upgrade, then the performance increase can be even greater. Below is a partial listing of some of Phelps Engineering Company’s more notable installations. This ethylene service cooling tower was upgraded with a Phelps design. No increase in fan HP. No add cells. Circulating water temperatures at design conditions were reduced 3.5°F.